OWING to the fact that the material dealing with the exhibits of A. V. Roe & Co. reached us very late, it has not been possible to include the article describing the Avro show machines in its proper place, alphabetically, and we have, perforce, had to place it here, at the end of our advance show report. While regretting the fact, we had no choice in the matter, as it was necessary to go to press with this week's issue of FLIGHT a good deal earlier than usual, and the makeup of the Olympia Show Report could not be deferred until the last minute. 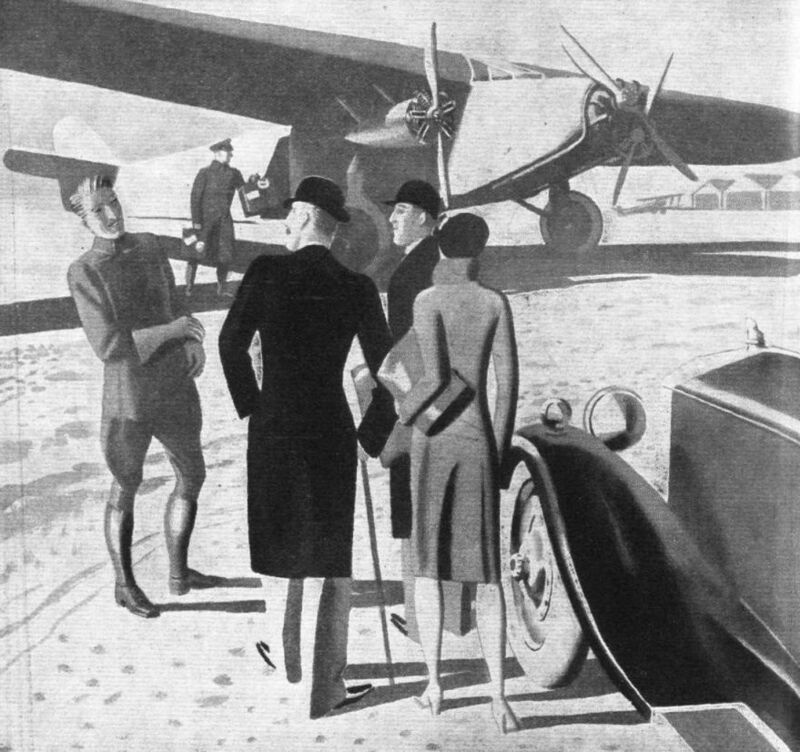 In effect a smaller edition of the Avro 10, the Avro 5 is a small saloon monoplane with accommodation for pilot and four passengers, with room for an occasional fifth passenger when desired. The power plant consists of three Armstrong Siddeley "Genet Major" engines, a new type of engine which will be seen for the first time at Olympia. 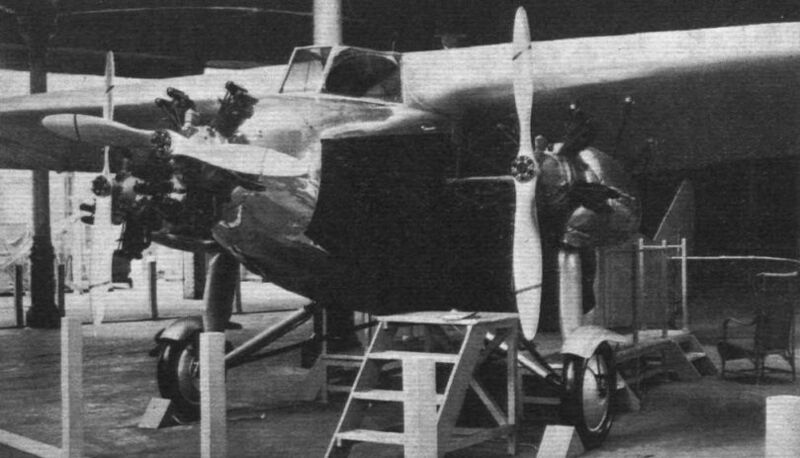 The construction of the Avro 5 is exactly similar to that of the Avro 10, with welded steel tube fuselage and all-wood monoplane cantilever wing, built in one piece. The pilot is situated in a completely enclosed compartment forward of the leading edge of the wing. From this position he has an excellent view in all important directions. The saloon is very comfortably equipped, with a single seat providing ample room for two passengers fixed across the rear end of the saloon, while two armchairs, adjustable for position, are provided for the other two passengers. All passengers face forward. Adequate ventilation, heating and lighting of the saloon is provided. The dimensions of the saloon are: Length, 7 ft. 6 in. ; width, 3 ft. 3 in. ; height, 4 ft. 6 in. Two baggage compartments are provided, a smaller forward under the pilot's cockpit and a large aft of the saloon. The total capacity of the two compartments is approximately 46 cub. ft. The overall dimensions of the Avro 5 are: Length, 35 ft. 9 in. ; wing span, 47 ft.; height, 9 ft. 6 in. ; maximum wing chord, 8 ft. 9 in. ; wing area, 333 sq. ft.; wheel track, 11 ft. 3 in. (Dunlop wheels with brakes). With a tare weight of 2,790 lbs. and a gross weight of 4,420 lbs., the non-paying load of the Avro 5 may be as follows: pilot, 180 lbs. ; fuel, 455 lbs. ; oil, 60 lbs. ; lighting equipment, 75 lbs. Total 770 lbs. This leaves a pay load for 4 passengers and luggage of 860 lbs. The performance of the Avro 5 is as follows: Full speed, 118 m.p.h. ; cruising speed, 95-105 m.p.h. ; range at cruising speed approximately 400 miles. Rate of climb at ground level, 750 ft./min. ; time to 1,000 ft., 1-5 min. ; time to 5,000 ft., 8-1 mins. ; time to 10,000 ft., 22 mins. Service ceiling, 13,000 ft. Absolute ceiling, 15,000 ft. 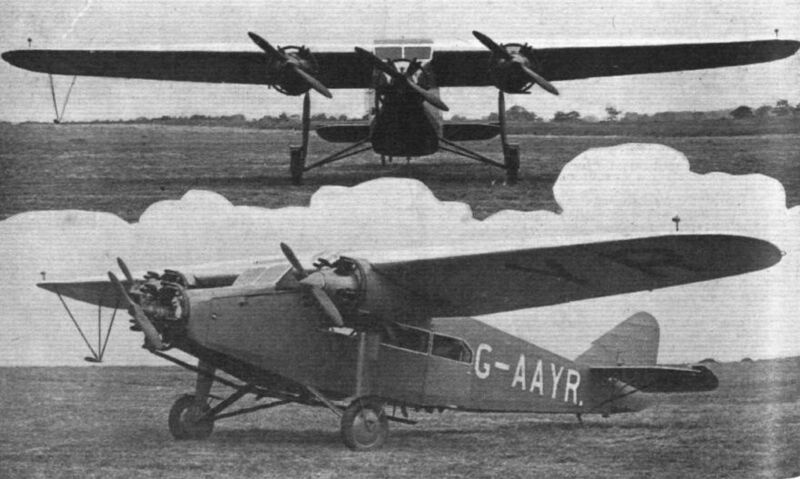 THE Avro V is the outcome of the purchase of the Fokker rights by A. V. Roe and Co., who, when they decided to enter the commercial market in a large way took the line that it would be far better for them to manufacture a well-known and tried type than to attempt to create a new market for a machine of their own designing. Actually the Avro V is not a Fokker type, but it is designed by A. V. Roe's on the same principles as the other larger Fokker machines which they are also turning out. 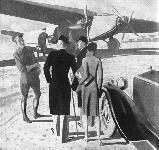 It is in effect a small edition of the Avro X, which in the country of its origin is the Fokker F VII 3 m. The front cockpit has accommodation for one pilot only, and the cabin behind him carries four passengers. The pilot's cockpit is, of course, in front of the leading edge of the main plane, and his seat is high, so that his view in all directions is very good indeed, in spite of the fact that he is completely closed in. The passengers have separate small chairs, and the cabin has large windows down the sides, so that all passengers can see out very well. There is also adequate provision for heating and lighting. Luggage accommodation is large. There are two compartments, a small one for heavy trunks, etc., under the pilot's cockpit, and a large one for lighter packages directly behind the passengers' cabin, both having access doors from the outside of the fuselage. 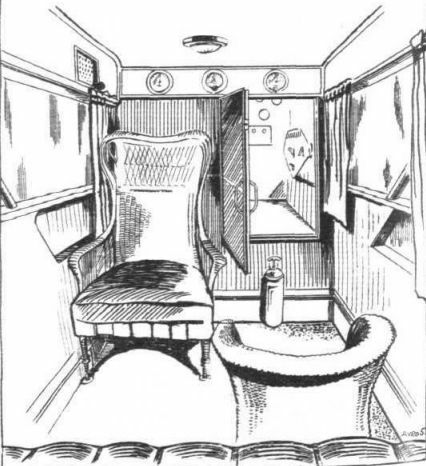 Between the cabin and the luggage compartment is a well-fitted lavatory. Constructionally the Avro V follows Fokker practice. The fuselage is built from steel tubes, and is a welded structure, while the bracing is either the Fokker double wire bracing through small loops at the angles of the struts and the longerons or else diagonal struts according to the situation in the fuselage. The main plane is a one-piece wing with boxed ply-wood spars, ply and spruce ribs and ply-wood covering. The undercarriage has an exceptionally wide track, and consists of a radius rod and bent axle to the bottom longerons on each side, and a telescopic leg which goes vertically upwards to the outer engine mountings. Wheel brakes are fitted. THE AVRO V: This illustration shows the placing of the three Genet Major engines. A very wide wheel track and independently-operated wheel brakes are features of this machine, which carried four passengers in addition to the pilot. AN ATTRACTIVE PROPOSITION: The Avro 5 is a small three-engined cabin machine fitted with Genet Major engines. A SECOND AVRO "FIVE" FOR KENYA: Our picture shows the "Knight Errant," the second Avro "Five" ordered by Wilson Airways of Nairobi, Kenya Colony. The first machine, "Knight of the Grail," was delivered by air by Capt. Campbell Black, who will shortly fly this second machine out to Kenya. THE AVRO V: This machine is not, as its registration letters might lead one to believe, the property of the Kodak Company, but of Wilson Airways, Ltd. It is here seen taking off from Heston Air Park. 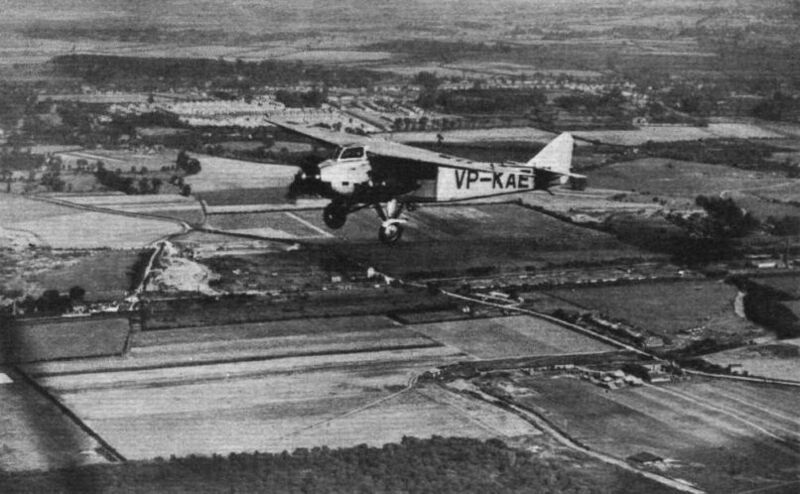 AN AVRO V (3 GENET MAJOR ENGINES) FLYING IN THE NEIGHBOURHOOD OF HESTON: Sold to Wilson Airways, Limited, this machine is to be put into service in Kenya. The staggering formation of aircraft was flown by instructors of Air Training Services Ltd in 1934. 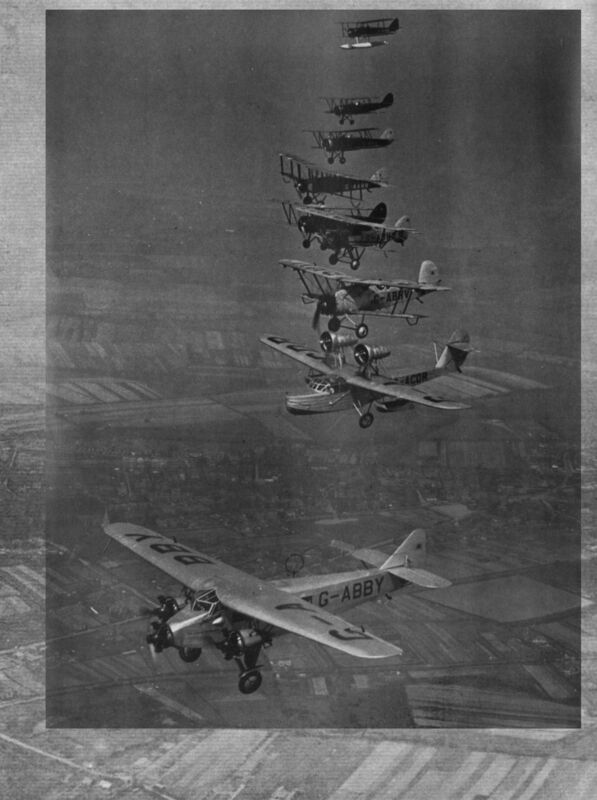 The aircraft are, from top to bottom: Avro Avian IVM, Avro Cadet, Avro Tutor, D.H.9J, Avro 626, Armstrong Whitworth Siskin III, Armstrong Whitworth Atlas, Saro Cutty Sark and an Avro Five. 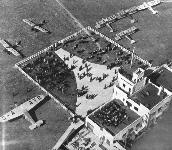 MEMBERS OF THE AVRO FAMILY: Beginning with the machine in the foreground, the types lined up are: The "Avian Monoplane," the "Avian" biplane, the "Avro Trainer," the Avro Five and the Avro Six. 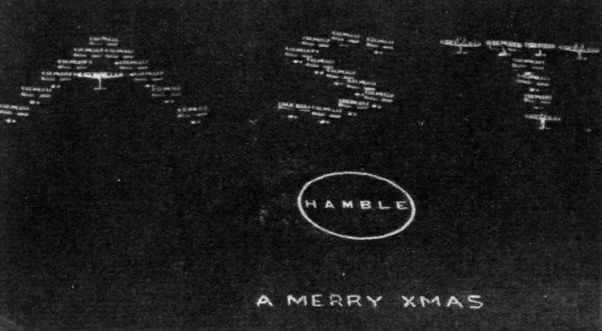 APPOSITE: Christmas greetings from Air Service Training Ltd. at Hamble. The message is formed by white-overalled humanity "on the hands down," and the "A.S.T." consists of the ten different aircraft types which form the organisation's fleet: Avro V, 626, Avian, Tutors and Cadets; two-seater Siskin; A.W. Atlas; two Cutty Sarks; and D.H. Leopard Moth and Hornet Moth. Avro Five, small commercial aeroplane. A NEW AVRO V: In this new version of the "Five," the outboard engines have been raised and faired into the wing. The height of the cabin has been increased by about one foot. The cabin has seating accommodation for four passengers, and behind the cabin is a lavatory. The engines are Armstrong-Siddeley "Genet Majors." A NEW AVRO TYPE: The Avro Six, an experimental machine recently produced, has accommodation for two pilots, side by side, and four passengers. The headroom is greater than in the Avro Five. Avro Six small commercial aeroplane. An Aerial view taken just as the Prince of Wales stepped out of his Puss Moth. His second machine brought one of his equerries. The Band of H.M. Grenadier Guards can be seen on the roof of the Club House. In the Avro 5 there is seating accommodation for five passengers, three in the back seat and one in each of the two arm-chair seats. The door communicates with the pilot's cockpit. 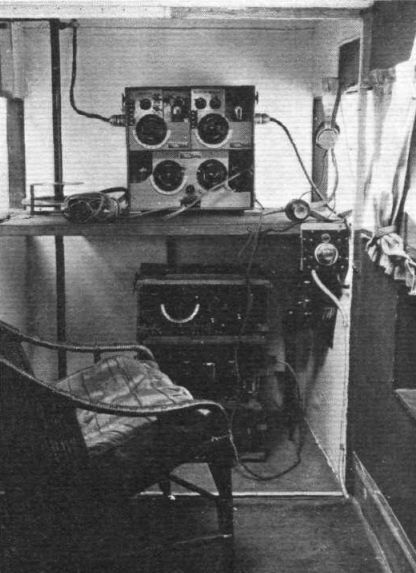 The equipment fitted in the Avro Five used by Air Service Training for wireless instruction.